I love how she flipped this loaded question into something positive! Im with you Auntie Oprah (as I usually am.). She was stopped by Extra and asked about the Chrianna reunion and appeared to be totally oblivious to it! I'm sure the interviewer at Extra expected Oprah to say more with the whole "disappointed" thing, but to their surprise Oprah was without cause for judgement. The reality is as Oprah made clear- that's Rihanna's decision to make. I think that if she is prepared to deal with that and is prepared to help him help himself then so be it. I have no judgment about it. That’s why I can sit there and have such a great time with her because I do all my interviews with no judgment whatsoever. If that’s how you choose to lead your life, that's really okay. I'm not sure why this whole idea of forgiveness, learning from mistakes, moving on, and living your life is so hard to grasp for some, but I'm glad Oprah & I aren't in that number. Anybody have the urge to burst out singing Chris Brown's Dont Judge Me? No? 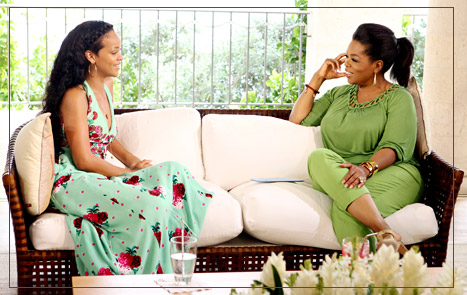 Ok.
Rihanna opened up to Oprah in an exclusive interview a few months ago about her life- which included her love for Chris. wow i was nervous when i saw this post. i didnt know what to expect from oprah, but im proud of her answer. give these babies a chance to live their own lives. I'm ready for Oprah to interview Chris Brown and Bobby Brown so we can find out their sides. Their sides are just as important.